Each epoch has unique characteristics for climate, geography, plants and animals. In the early 1800’s, the system for naming geologic time had only four periods. The periods were named using the Latin words for first, second, third and fourth. The word tertiary means “third.” It was the third period in the old naming system and the first part of the Cenozoic Era. The name Tertiary is still used for the early Cenozoic, even though we have a new naming system. Today we use Paleogene for the first part. Look at the chart below to compare the new system with the old. The beginning of the Paleogene Period was very warm and moist compared to today’s climate. Much of the earth was tropical or sub-tropical. Palm trees grew as far north as Greenland! By the end of the Paleogene, during the Oligocene Epoch, the climate began to cool. On the chart below are some of the major geographic events of the Paleogene. Notice that on this chart, and on most charts of geologic time, the oldest time is located at the bottom. 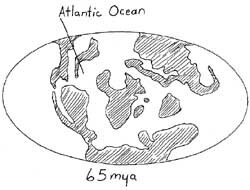 This is how the earth looked at the beginning of the Paleogene Period. Look at the bottom of the chart. See if you can find the geographic events from the Paleocene Epoch. As you read the chart from the bottom to the top, try to imagine the continents moving into their present-day locations. The plants of the Paleogene Period are very similar to the plants that we have on earth today. The warm climate at the beginning of the period was perfect for the dense forest plants. As the climate cooled, open woodlands and grasslands became abundant. The grasses were important because they supported huge herds of grazing animals. The extinction event at the close of the Cretaceous Period wiped out the dinosaurs, large reptiles, and many other species. This left room for new animals to develop. Mammals became the dominant animals. In fact, the Cenozic Era is often called the Age of Mammals. Most of the main groups of mammals were present by the Eocene Epoch. With the dinosaurs and other large reptiles gone, mammals grew in size, numbers, and diversity. They filled ecological niches in the sea, on land and in the air. Many of the animals that we know today evolved during the Paleogene Period. 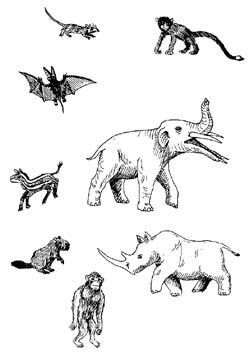 On the chart below you will see familiar animals and the epochs when they first appeared. 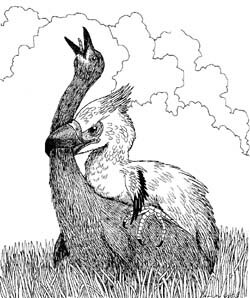 The Paleogene Period favored the birds. New species evolved. There were many large flightless birds that are now extinct. These birds did particularly well until the mammals developed so many species. Many of the birds we know today were present in the Paleogene Period. In the oceans, fish species branched out. Sharks became more plentiful. Trout and bass evolved along with many other fresh water species of fish. Huge lakes formed in the western United States during the Eocene Epoch. The Green River Formation is a famous fossil rich area created by these lakes. Many kinds of fossil fish are found in this rock formation today. Mammals developed in the oceans, too. Primitive whales, one of the largest mammals, began to develop at this time. The insect population increased in the Paleogene Period. Bees and other insects that lived on the pollen and nectar of the flowering plants increased in numbers and variety. The Paleogene Period had begun with a hot and humid climate, but the climate was becoming cooler and drier. The cooler temperatures were the signal of many changes coming to the earth. The thick tropical forests would not be able to survive the cooler, drier climate. If we could go back in time and feel the climate at the end of the Paleogene, we would say it was quite warm. Compared to our climate today, it was still pretty hot! The plants and animals could feel the changing climate and as time marched into the next period, many of them would have to adapt or die.